Woohoo baby! Check out the headless, legless mannequin on the curb. Can you imagine a Def Col babe wearing THAT? Wowsers! 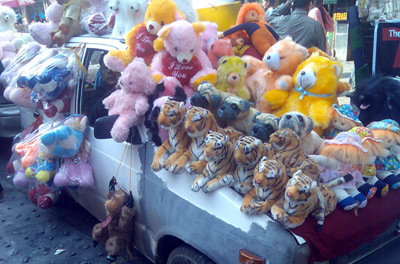 Outside New Market in Kolkata, we were greeted with this menagerie lined up along 6 cars. The dudes in the car had nothing to do with the animals. They were just parking/waiting. The enterprising vender told me he just moves his stuff around when the cars need to leave. Tusha, in full journalist style, went up to talk to the driver on whose car the gorillas, lions, boxers, teddies, and polar bears were hanging out. He tried to hit on her. I dragged her away. 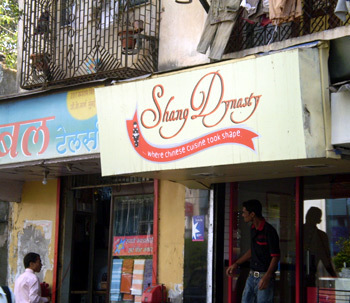 But here’s someone in Lower Parel making some pretty lofty claims.